Back or neck injuries can be among the most debilitating injuries a victim can suffer. Whether the injury is to the muscles of the back, neck or the vertebrae of the spine, recovery from these injuries can take an extremely long time. Some injuries never completely heal, leaving victims to face a future with far less potential than the one they deserved.Back or neck injuries that happen in accidents because of another person’s wrongful act or negligence can create grounds for victims to seek damages in a personal injury claim. These are complex cases that require the attention of a qualified lawyer. If you or a loved one is suffering because of a serious back or neck injury, it is important that you seek the advice of a reliable Orange County attorney as soon as possible. At Chambers & Noronha in Santa Ana, we represent clients in all types of back or neck injury claims, including herniated disks and severe muscle injuries among others. We will thoroughly investigate your accident to determine exactly how it occurred and who was responsible. We will seek to hold all negligent parties accountable and diligently pursue the best possible outcome for you and your family. We are not the type of firm that accepts the first settlement offer and moves onto the next case. Our primary concern is for your long-term welfare. 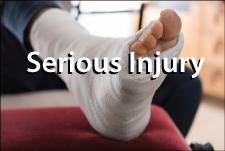 We will take the time to understand the full extent of your injuries and do everything in our power to obtain maximum compensation on your behalf. If a fair settlement cannot be negotiated, we will not hesitate to litigate the matter. We will stand beside you at every step. Contact our Southern California office to learn more about your rights and legal options. You can reach us by phone at 714-558-1400 or contact us via email to schedule a free consultation with an attorney.